English biologist and writer who did research on evolution and how an organism develops from egg to adult. He was well-known for popularizing science to the layman through dozens of books and radio broadcasts. He was the first director-general of UNESCO, the United Nations Educational, Scientific, and Cultural Organization (1946-48). This quote comes from an essay, “Heredity: 1. The Behaviour of Chromosomes” which was collected in Huxley's Essays in Popular Science1, first published in 1927. By 1929, that book appeared in a list of “One Hundred Popular Science Books”1 which was a selection chosen to be attractive to the general reader, while at the same time authoritative and modern in their treatment of the subject. This was a time long before any understanding of DNA, so to gain any understanding of heredity, interested geneticists were dependant on experimental observation to progress. The quote above appears early in Huxley's essay to express the importance of investigation to gain knowledge of the facts, which must be undertaken before any understanding could be drawn. Which, of course, remains true in any field of science. 1 Journal of the Washington Academy of Sciences (4 Jun 1929). 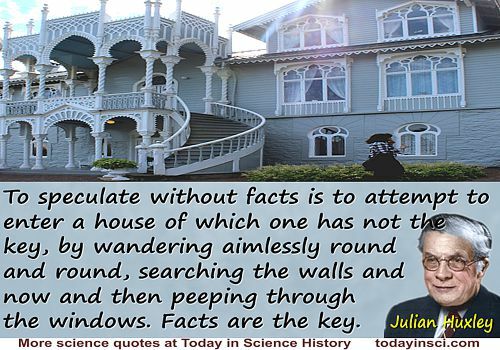 Science Quotes by Sir Julian Huxley. 22 Jun - short biography, births, deaths and events on date of Huxley's birth.